A San Luis Obispo police report estimates the damage the fire caused to the computer lab alone is close to $1.35 million. However, San Luis Coastal officials say that is a conservative estimate when factoring in cleanup and rebuilding costs, as well as new furniture, computers and other equipment. In addition to burning the computer lab, the Dec. 8 fire caused significant damage to the adjacent wood shop building. The police report estimates the damage done to the wood shop building at $250,000 to $500,000. On top of rebuilding and fixing the structures, the school district is facing costs related to moving students, altering curricula and replacing damaged materials in the wood shop building. 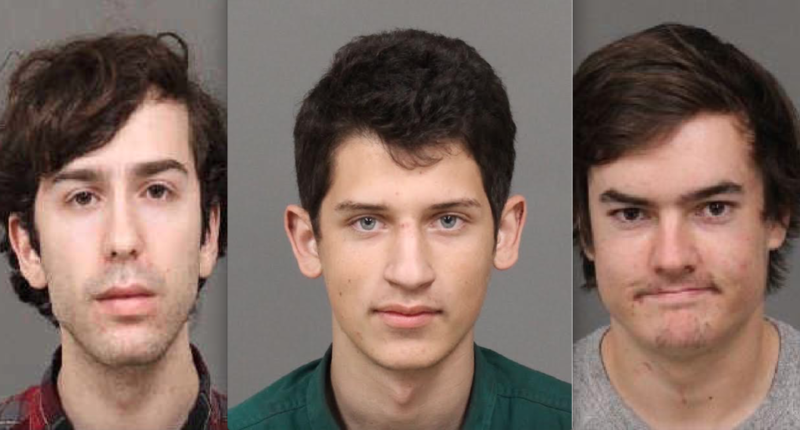 On Tuesday, all three defendants in the case, Michael Benadiba, 18; Cameron Bratcher, 18; and Jacob Ruth, 19 appeared in San Luis Obispo Superior Court. A judge raised Benadiba and Bratcher’s bail from $25,000 to $100,000. Still, both Benadiba and Bratcher bailed out of jail following the hearing. Ruth remains in jail with his bail set at $500,000. Ruth has been in custody since Dec. 16, the date of his second arrest. Police officers arrested each of the defendants early on Dec. 9, shortly after the alleged arson. The defendants then bailed out of jail, and days later, officers arrested them again on additional arson charges. Ruth faces multiple arson, as well as burglary charges for separate incidents at the school in the weeks leading up to the computer lab fire. On the night of the fire, officers found the defendants inside Ruth’s Ford Fusion sedan. Ruth allegedly allowed officers to search the vehicle. While searching the car, the officers found an unused road flare with a stick attached to it. A partially burnt flare of the same model was reportedly lying at a nearby location outside the car. A court declaration filed by district attorney’s office investigator Hank Abbas states Benadiba confessed to detectives that all three of the defendants were responsible for the fire. Benadiba also allowed the detectives to search his cellphone, where they found a video showing a gloved hand pulling a fire alarm. A time stamp on the video showed it was shot at 10:15 p.m. on Dec. 6, the same night a fire alarm went off at SLO High, according to the declaration. The court filing also states SLO High’s computer lab was burglarized on the night of Dec. 5; fire suppression equipment was destroyed at Pacheco School and the San Luis Obispo Classical Academy on Oct. 13; and heat sensitive equipment was recently removed from a fire sprinkler at Laguna Middle School. Abbas’ report does not state whether investigators believe the defendants were involved in those incidents. All three defendants have pleaded not guilty. They are due back in court on Jan. 5. WHAT ON EARTH….would provoke such anger towards one particular teacher that it would result in this kind of rage? People get lost in the details–but I never do. Let’s find out what that teacher did…is it what I suspect? You must be another person who believes everything is someone else’s fault, and refuses to put the guilt where it belongs, in this case on these three young adults. I initially thought it was the age of adolescence that got these kids. I think I was wrong on that one. I admit it. Arson is a crime of rage–contained over a period of time–and many times results from something that cannot be spoken of, because it is either so horrible for the victim, or so seemingly outrageous that the person (or people) speaking of it would never be believed. What happened to these boys? I think it is time to stop attacking everyone involved and get to the root of this. Yeah, these boys are just misunderstood youth and probably were the real victims. They are not responsible for their actions and the real guilty people are whomever treated these poor children wrong when they were young…… Excuse me while I throw up, come on, time to stop this participation trophy stuff and start holding everyone responsible for their own actions. Of course this starts with those in charge and that doesn’t seem to be happening anytime soon so I don’t know the likely hood of it filtering down but we also know those in charge just make the rules for us and often don’t feel they should be held to the same standard. I don’t agree with you by-the-way… Recognizing what brought them to that point does not mean being held less accountable, what it means is trying to understand the motivation so maybe someone can head off any further BS. That’s all… One of the things that empowered me to no end and I give a huge amount of credit to for keeping me out for 20 years now was the revelation that some of my (re)actions were not something I was consciously aware of and were dictated by how I was raised. That’s science, folks! Now what I chose to do with information from that point forward (mainly? stop and think a f***in’ minute) was MY choice and I have faired real well since. Initial estimates were in the $350,000 range. Then $750,000. Now 1.8 Million and climbing. “A San Luis Obispo police report estimates the damage the fire caused to the computer lab alone is close to $1.35 million” SLOPD are now experts in construction bidding! At this rate the Measure D funds will be exhausted. With that kind of money you could loan Eric Prater enough for 2 houses. I am hoping a building contractor will weigh in here. They are encouraging even more donations–milking it. It’s only taxpayer money, there is an unending supply of it because they can always scare people or threaten to cut services if they don’t get more money. The $750,000 estimate has sure gone up. If their parents have insurance this could be a $3,000,000 class before job is over. I wonder if it all started with pot use. It started with them being disrespectful punks. You’re probably right… The combination of their long surpressed rage and the evil weed is a sure combination for arson. I know I just feel like burnin’ the world down after burnin’ one, just can’t get off the couch to do so though… Come on! You’d probably find a better and more compelling link to their video games then to pot. No prison time, no jail time… Let them pay at least some of this back by doing community service for the remainder of their teens and well into their twenties.